Now with FREE SHIPPING for all continental U.S. orders over $100! Students will be able to read and spell simple words with consonant digraph spelling patterns in initial, medial, and final positions. A consonant digraph consists of two adjacent consonants that produce one sound. The digraphs sh, ch, and th represent unique sounds that are not usually associated with any individual letters of the alphabet. The digraphs kn and gn are associated with the sound of /n/, and the digraph ph is associated with the sound of /f/. Learning to recognize the consonant digraphs is very helpful to beginning readers and writers because many early reading words contain these special two letter combinations. Ex. Digraph ch: children, chair, which, reach, Digraph sh: she, push, shall, show, wash, fish; Digraph th: the, they, them, there, three, with, mother, father, brother, both; Digraph kn: know, knew, knock, knee, knot; Digraph ph: phone, graph, geography, trophy; Digraph gn: gnat, gnaw, sign, design, reign. The song Two Little Letters (Sing Your Way Through Phonics Volume 1) teaches children to recognize the most common consonant digraphs at the beginning, middle, or end of words. Be sure to read the “Extensions” section below for additional digraph activities and for adapting the song to teach consonant blends. Note: If you do not have the CD or Mini-Charts, you can still teach this consonant digraphs lesson plan using the folk tune listed on the Two Little Letters Song Lyrics page. You can create your own mini-charts using the words in bold print letters in each verse of the Song Lyrics. 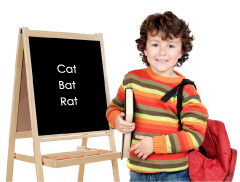 Find out more about Sing Your Way Through Phonics products. Order our cost-saving Volume 1 Combo online. Revisit Mini-Chart p. 56 and ask children to look at the three words on this page. Point to the first word and ask, "What part of the word they has the /th/ sound?" (beginning) "What part of the word both has the /th/ sound?" (end) "What part of the word mother has the /th/ sound?" (middle) Say these three words in unison and ask children to put a finger to their lips when the make the /th/ sound. Repeat this procedure with Mini-Chart pp. 57 and 58. Listen to CD Track 13 (Two Little Letters), pointing to the words on the Mini-Charts as they occur in the song. Pause the player after the verse for Mini-Chart p. 58. Restart the recording and ask the children to join in the singing. Pause the player again after the words on Mini-Chart p. 58 are sung. Revisit Mini-Chart p. 59 and ask children to look at the three words on this page. Point to the first word and ask, "What part of the word know has the /n/ sound?" (beginning) "What part of the word knew has the /n/ sound?" (beginning) "What part of the word knee has the /n/ sound?" (beginning) Say these three words in unison and ask children to put a finger to their lips when the make the /n/ sound. Repeat this procedure with Mini-Chart pp. 60 and 61. Ask the students to join in the singing of the rest of this song. Take the player off pause and resume Track 13. Point to the words on pp. 59-61 as they occur in the song. Tell the children that we are going to try singing the entire song now. Restart Track 13 and point to the target words on each page. Sing along with CD Track 13 again (Spelling Families) and allow students to point to the target sets of words on the Mini-Charts while singing. Practice singing Two Little Letters daily for a week. Then try singing the song without hearing the words, using the instrumental track (Track 14). Allow different students to point to the Mini-Charts words while singing. Help students create other sets of digraphs for the song. Make 6 copies of Mini-Chart Template B on p.96 and allow students write in the new sets of words. Examples: think/math/father, chop/peach/watching, show/rush/flashing, knead/knit/knife, gnome/reign/assignment, photo/trophy/paragrah, . Place these pages back-to-back in page protectors in a 3-ring binder. Then sing the song with the instrumental version (Track 14). Introduce the Read-and-Sing Book, Two Little Letters. As readers sing along with the lively song set to the folktune The Bluetail Fly, they can follow clues in the illustrations and point to each digraph word. Once the children have become familiar with the digraphs in this song, they can use the instrumental track to substitute their own digraph words and illustrate their own digraph books. Example: Replace the words chick, reach, and teacher with chalk, lunch, and woodchuck. Children can learn about two-letter vowel combinations like ea, ee, ai, and oa with the Read-and-Sing book, Talking and Walking. Keep a few copies of the book at a literacy center equipped with headsets so that students can gain practice in listening, singing, and reading consonant digraph words. Use a "phonics phone"(an arc-shaped piece of PVC pipe) and have children listen to themselves pronouncing the digraphs. Listen carefully for the differences between /th/, /sh/, /ch/, and /ph/. Ask children to describe where they place their tongues for each of these sounds. Two little letters that blend two sounds. They stick together wherever they're found. Those two letters are c and l in clip and clap and cyclone. Use the instrumental version of the song to practice two-letter final consonant blends like rm—worm/firm/arm, st —west/lost/must, ld—field/child/told, nt—spent/front/present, rd—hard/bird/word, lt—belt/bolt/built, etc. Students correctly produce the sounds of consonant digraphs th, sh, ch, kn, gn, and ph. Order our cost-saving Sing Your Way Through Phonics Volume 1 Combo online ($33.95) containing the CD, Mini-Charts, Song Lyrics, and Teaching Suggestions — everything you need for this lesson! Or, print out an order form to mail/FAX to us. Building readers and writers through music in over 200 School Districts nationwide and overseas! Copyright © 2012 Action Factor, Inc.